Extracellular Targeting of Cell Signaling in Cancer highlights innovative therapeutic strategies to treat cancer metastasis and prevent tumor progression. Currently, there are no drugs available to treat or prevent metastatic cancer other than non-selective, toxic chemotherapy. With contributions from an international panel of experts in the field, the book integrates diverse aspects of biochemistry, molecular biology, protein engineering, proteomics, cell biology, pharmacology, biophysics, structural biology, medicinal chemistry and drug development. A large class of proteins called kinases are enzymes required by cancer cells to grow, proliferate, and survive apoptosis (death) by the immune system. Two important kinases are MET and RON which are receptor tyrosine kinases (RTKs) that initiate cell signaling pathways outside the cell surface in response to extracellular ligands (growth factors.) Both kinases are oncogenes which are required by cancer cells to migrate away from the primary tumor, invade surrounding tissue and metastasize. MET and RON reside on both cancer cells and the support cells surrounding the tumor, called the microenvironment. MET and RON are activated by their particular ligands, the growth factors HGF and MSP, respectively. Blocking MET and RON kinase activation and downstream signaling is a promising therapeutic strategy for preventing tumor progression and metastasis. 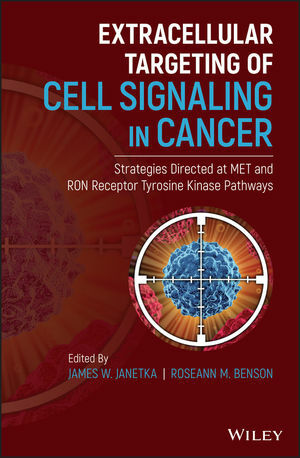 Written for cancer physicians and biologists as well as drug discovery and development teams in both industry and academia, this is the first book of its kind which explores novel approaches to inhibit MET and RON kinases other than traditional small molecule kinase inhibitors. These new strategies target key tumorigenic processes on the outside of the cell, such as growth factor activation by proteases. These unique strategies have promising potential as an improved alternative to kinase inhibitors, chemotherapy, or radiation treatment. Dr. James W. Janetka is an Associate Professor at Washington University School of Medicine, and has over 20 years of medicinal chemistry and drug discovery experience within both industry and academia. He has published 50 peer-reviewed manuscripts and holds 20 US patents in oncology and infectious disease. Roseann Benson is a chemical engineer turned scientific writer and editor. As a consultant for Harvard and Washington University Medical Schools, she has edited and contributed to manuscripts and books that have been published by Wiley, CUP, Nature, and Science.